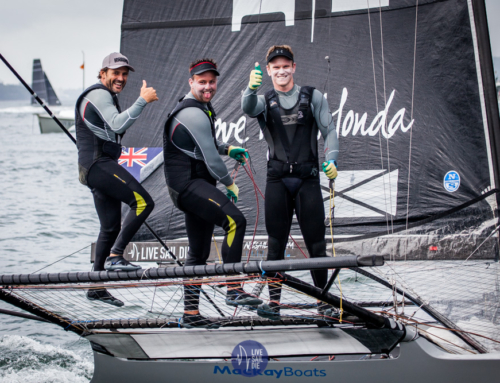 Honda Marine is the new sponsor behind the successful trio Dave McDiarmid, Matt Steven and Brad Collins and the team is already ripping it up on their home turf as they prepare for the 2018 JJ Giltinan Championship in Sydney in late February. 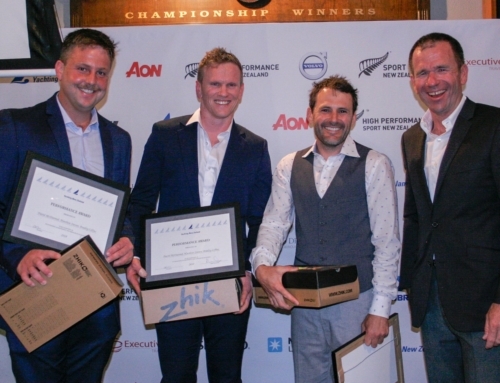 The team were recently awarded a Yachting New Zealand Performance Award and won Royal Akarana Yacht Club International Sailors of the Year, and after six races are currently leading the 2017 Auckland Skiff Championship hosted by their home club, RAYC. 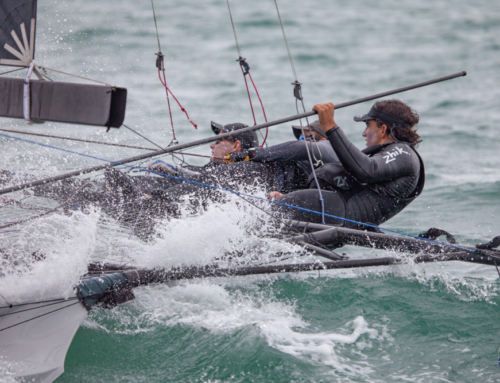 The 12 race, two weekend series gives 18′ Skiff and 12′ Skiff sailors the chance to race longer courses as they prepare for their major events and during the first weekend, the 2-3 December, the fleets had a mix of conditions ranging from 5 knots, to a perfect 15 knots in the afternoons. After six races, Honda Marine leads the 18′ Skiffs after some very close racing. But at the end of day one, it was C-Tech and Knight Frank who took the early lead respectively. C-Tech was the most consistent as Knight Frank managed to miss the finish in race two handing the win to C-Tech and the boat of the day honours. While Honda Marine won the first race, they experienced a shocking capsize during race two and narrowly miss judged a layline in race three. Racing in the fleet was extremely close and these mistakes by Honda Marina cost them dearly. Day two started off lighter with the breeze slowly building throughout the day. Honda Marine recovered from their day one disaster and had a clean sweep on the scorecard, however the racing was still frighteningly close. Race six highlighted this when C-Tech, Knight Frank and Honda Marine rounded the last top mark within 20 seconds on each other in that order. All three boats gybed simultaneously after rounding the Rough Rock mark and had a drag race, bow to bow. Honda Marine eventually popped out in front with just 100m to go to the finish line. ASCC and Maersk Line, who joined the regatta on day two had some good battles between themselves in the building afternoon seabreeze. With number one rigs on it was a hectic weekend leaving the sailors aware that more time needs to be spent in the gym. “It was an awesome weekend of racing,” said Honda Marine mainsheet man Matt Steven on the ramp post racing. Racing for the 2017 Auckland Skiff Championship continues on the 9-10th December from 1100 hours both days. This weekend the Flying 15 fleet will join the skiffs on the race course and on Sunday, the Akarana Series continues with M-Class joining in with the action.